When: April 8, 7:30 a.m. 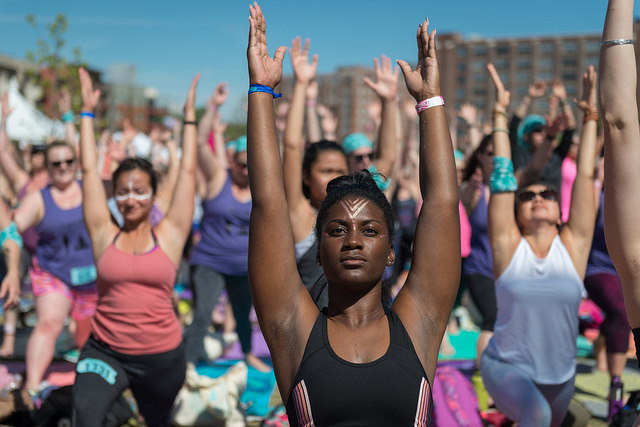 Details: Self-dubbed as “the world’s only mindful triathlon,” this event begins with a 5K run or walk, followed by a DJ-guided yoga session, and a guided meditation. Once you’ve aligned your chakras, finish off the day with food and shopping around the Kula Market or keep the flow going and try Aerial or AcroYoga. When: April 7, 2-5 p.m. Details: Grab your softest (but feather-free!) pillow and gear up for International Pillow Fight Day. The only rules are to swing softly and don’t hit anyone who isn’t brandishing a pillow. When: April 8, 10:30 a.m. Details: Families are invited to the Smith Family Farm to get a look at the process of cloth making—from the sheep to the clothes we wear. The demonstration will include the shearing of the sheep and angora goats, wool dyeing, and the spinning and weaving processes. There will be ongoing activities throughout the afternoon like candle-dipping and a petting zoo. When: April 8, 2-6 p.m. Details: The 4.4 mile stretch of Decatur Street and DeKalb Avenue will be closed to cars and opened up to anything with two wheels (non-motorized) or two feet. The first Atlanta Streets Alive event of the year, this route is brand new and will connect 11 Atlanta neighborhoods for you to play, shop, or eat. When: April 10, 5-8:30 p.m. Details: Join Atlanta magazine for a night of cocktails, music, and shopping at Avalon. There will be in-store promotions specifically for those in attendance and a chance to win a special weekend for two at the Hotel At Avalon.